Russian opposition leader Aleksei Navalny and hundreds of other protesters have been detained by police at an unsanctioned demonstration on May 5 in Moscow, part of a nationwide series of protests organized by Navalny ahead of President Vladimir Putin's inauguration for a fourth presidential term. 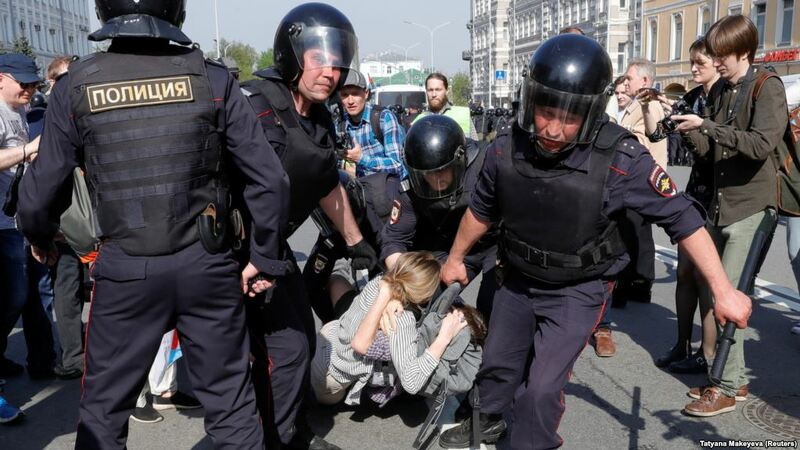 Navalny was taken into custody shortly after arriving at the rally on Pushkin Square in the center of the Russian capital where riot police carted away other protesters while some were beaten by pro-Putin vigilantes. Navalny ally Ilya Yashin told the Interfax news agency that Navalny had been charged with the administrative offense of disobeying a police officer. He could face up to 15 days in jail. According to the independent police-monitoring group OVD-Info, some 1,612 people have been detained in 26 cities nationwide in connection with the rally. Some of those detained were reportedly minors. In Moscow alone, the number of detainees was 703. Another 233 protesters were also detained in St. Petersburg. Media reports said that the number of protesters in Moscow was in the thousands. Police said the crowd numbered some 1,500 people, but officials routinely downplay the size of opposition protests in Russia. About 1,000 people are estimated to have participated in the rally in St. Petersburg. Under the slogan "He's not our tsar," Navalny, 41, had called on supporters to take to the streets ahead of Putin's May 7 inauguration to protest what Navalny says was Putin's autocratic rule.